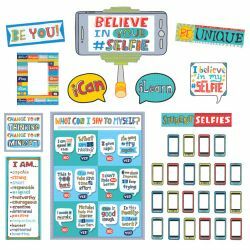 Help students to think positively about themselves, build self-confidence, and develop a growth mindset with this Believe in Your #Selfie Bulletin Board. This contemporary set can be used to display student work or highlight each student to help promote individuality and create a positive classroom community. No: I am not good at this. Yes: What am I missing? No: I give up! Yes: I'm going to try again. No: This is too hard. Yes: This may take some time and effort. No: I can't make this better. Yes: I can always improve. I'll keep trying. No: I made a mistake. Yes: Mistakes help me improve if I learn from them. No: This is good enough. Yes: Is this really my best work?